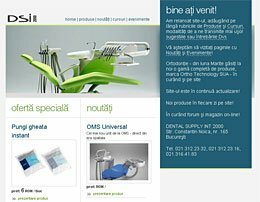 Dental Supply International 2000 :: National Portfolio :: PRO IT Service S.R.L. - Choose a professional and accessible service for your online image! Mihai was able to translate my vision for the site into Movable Type down to the smallest detail. During the development process he provided lots of feedback on my ideas and he was able to offer multiple solutions for the various features that I wanted to include.